Dimensional stability process managed to ensure product dimensional constancy during manufacturing processes to provide close product tolerance to customers. Actually, quality assurance team is prepare and implementation dimensional stability process. This procedure purpose is to compliance of quality requirements to improve customer satisfaction. Normally, dimensional stability manage during quality tests to considering dimensional tolerances as required as specific characteristics. Quality team, manage the product standards, customer technical requirements during the manufacturing processes. even, they have to frequently monitor and ensure that the product dimensional constancy should be maintains. When quality team performing this task, they have to consider the dimensional stability standards needs. The standards may includes – customer requirements, technical fulfillment, and comply requirements of end application. Even on completion of the first trial, or initial product lot, laboratory personnel may take the sample for further analysis. The lab technician will inspect the quality of the sample to ensure the standard requirements. They are also frequently monitor the sample during in-process. How to managing in regular tasks? Dimensional stability verification and testing process is conducted on base of the standard requirements. The product specification are considering for the verification of the product by quality engineers. The product standards dimensions are managed as product specific method and dimension required as end application. And quality engineers are verify dimension as customer provided technical details. International standards references are important for matching and improvement of product quality are consideration required. Some time customers are expecting dimension which are little different than standard product dimension that need to extra care for production line. As well as quality team for maintaining stability of product dimensions. Quality team is considering product dimensions during various testing for parameters of product dimensions to accurate reading, close tolerance verification. Identify variations / deviation in the product dimension as random sampling, in-process online samples are general or regular product for quality team. The dimensional stability verification process is conducted as per standard requirements of quality inspection. generally the verification and inspection is managed as per product standard requirements. Customer specific requirements for quality testing. And close tolerances and product dimensional stability requirements for end applications. The frequency of inspection process, verification and testing is managed by quality team. To conduct required parameters as per standards and actual product dimensions. The team is verify initial measurement of product dimensions. There are conducted various tests two to three time to ensure that the product dimensions are maintained requirements of tolerances and stability. Quality team is verify each actions, activities and inspection processes. Established required documents for recording and sustain best practices in manufacturing facility. 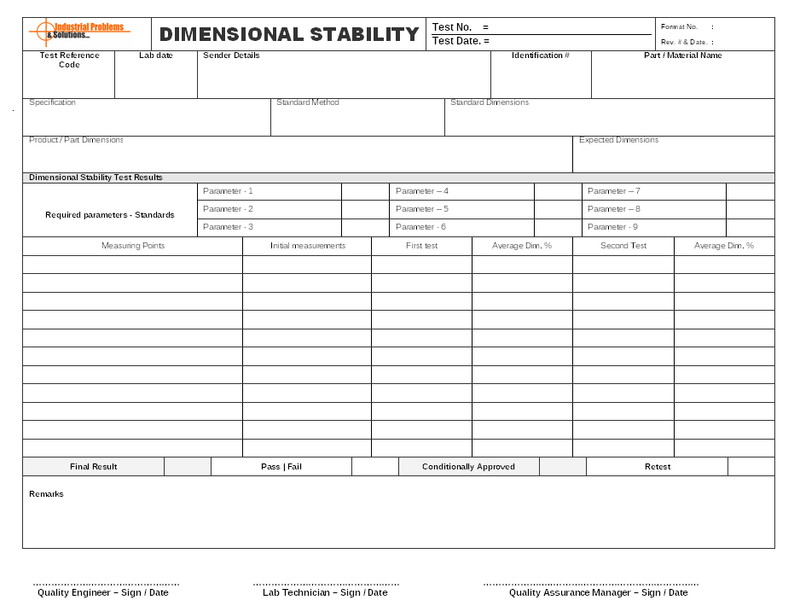 The dimensional stability report format is use for recording information of quality inspection. Verification and testing of product dimensions to ensure the product stability as per customer requirements. Technical and standard requirements during producing materials. The manufacturing facility is conducting quality instructions, requirements & reviewed by quality team is handling for improvement of product quality. Dimensional stability tests & its achieve results are managed for product improvement, quality team is handle records and discuss with management, production peoples and concern authority to managing each activity during manufacturing processes, and handling standard dimensions accurately. First Published: Sunday, November 22, 2015.